Starting with Version 4.0, XML exports from PubMed may be imported into BizInt Smart Charts for Patents or BizInt Smart Charts for Clinical Trials. Although records from PubMed may come from sources other than MEDLINE, all results are treated as MEDLINE at this time. Perform your search on PubMed. Click the "Send To" element to open the Send To panel. Select "File" as your destination. 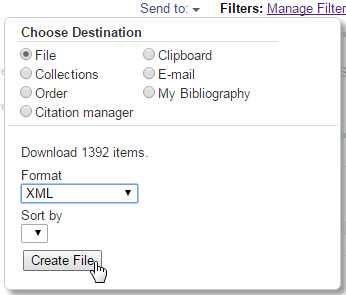 Under Format, select XML, and click the "Create File" button. Import the results into BizInt Smart Charts for Clinical Trials or BizInt Smart Charts for Patents. Since the file type is .XML, you can either import the file with File | Import, of you can drag the file into BizInt Smart Charts and drop it there to start the import process.